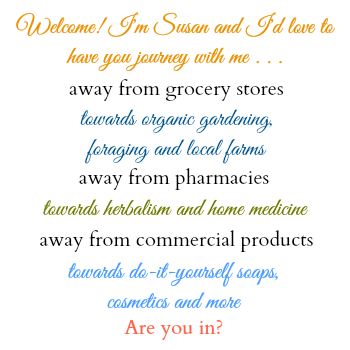 You are here: Home / Natural Skin Care, Soapmaking & Cosmetics / Common Makeup Ingredients: Are They Safe? Sometimes change is instantaneous. I watched Food, Inc., and immediately started buying pastured meat, milk and eggs from local farms. I never looked back. With other things, for some inexplicable reason, I’ve been slower to clean up my exposure to potentially harmful chemicals. Personal care products are a case in point. I’m good with soap, shampoo, and laundry detergent since I make my own. Sometimes I even make homemade tooth powder. But I had been dyeing my hair for years and refused to let myself think about what the ingredients were doing to me. Just about a year ago, though, I stopped and let my hair go gray. And it’s ok. I think I even like it. Makeup has been my last holdout. I’ve made some steps. I moisturize with tallow and make some of my own skin care products. I’ve even made my own mascara, but it didn’t turn out too well. The thing is – I like my makeup. But I’ve been researching some of the ingredients for the specific products I like, and it’s not looking good. If you want to do some research on the brands you are using, or on specific ingredients, this is where I found that info. Our skin is our body’s largest organ; it can absorb any product that is applied, including makeup. Makeup often contains chemicals like phthalates, petrolatum, parabens, formaldehyde, and even lead. Do I really want to being using products that are potentially carcinogenic, that disrupt hormones, and that are toxic to my system? Products labeled natural or organic often contain synthetic chemicals, and even truly natural or organic ingredients are not necessarily risk-free. The global, plant-based pharmaceutical market, valued at $19.5 billion in 2008, relies on the ability of “natural” chemicals – like those used in some natural cosmetics – to significantly alter body functions, a far cry from innocuous (BCC Research 2006, 2009). On the other hand, products labeled “organic” or “natural” can contain petrochemicals and no certified organic or natural ingredients whatsoever. Products certified as organic can contain as little as 10% organic ingredients by weight or volume (Certech 2008). FDA tried establishing an official definition for the term “natural,” but these protections were overturned in court (FDA 1998). Research shows that 35 percent of children’s products marketed as “natural” contain artificial preservatives (EWG 2007a). 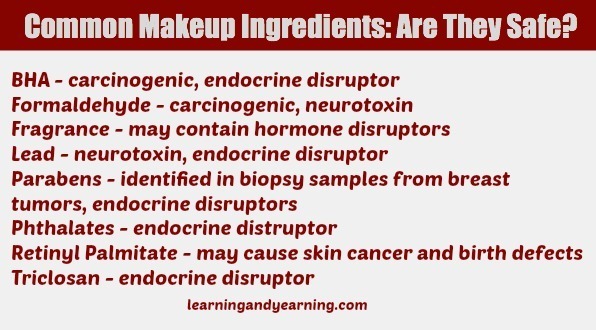 Makeup labeled as natural or organic can still contain questionable ingredients. USDA-certified organic means 95% or more organic ingredients. But a claim of “made with natural ingredients” or “made with organic ingredients” leaves lots of room for potentially harmful synthetic ingredients. And while there are many good products out there, the prices are definitely out of my price range. So …. what’s a girl to do? For me, the only solution is to make my own. 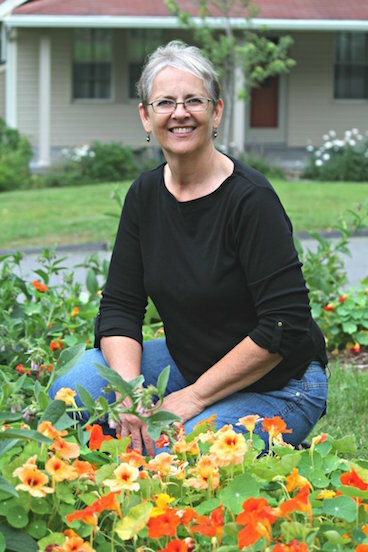 I’ve downloaded a number of eBooks (like this and this) and they each have some decent little tidbits, but the one I love the most comes from fellow blogger Lori Klein at Health Extremist. Lori has done her homework. 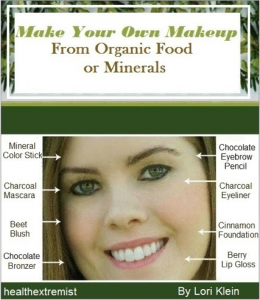 Her eBook, Make Your Own Makeup with Organic Food or Minerals has over 100 money saving recipes made from safe ingredients. For example, did you know …. that you can use coffee or chocolate as a skin bronzer? that you can make blush from blackberries? and mascara and eyeliner from cocoa powder? lip gloss from hibiscus tea? 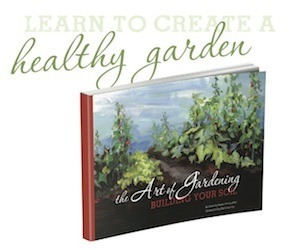 And Lori includes a resource section with sources of all of the ingredients. That alone is worth the price of the book. I really get frustrated looking for odd ingredients, so I’m thrilled that she’s done the work for me. The regular price for Make Your Own Makeup with Organic Food or Minerals is $21.95, but Lori let me know that right now she is offering it for $9.95, about the same price as the lipstick I normally purchase! Just click here to buy the eBook. Thanks, Susan, for this helpful post. I know I need to change some things in this area, and this will be a great resource. I appreciate your site for all things healthy! Thank you. Hi Sarah, you are so welcome!